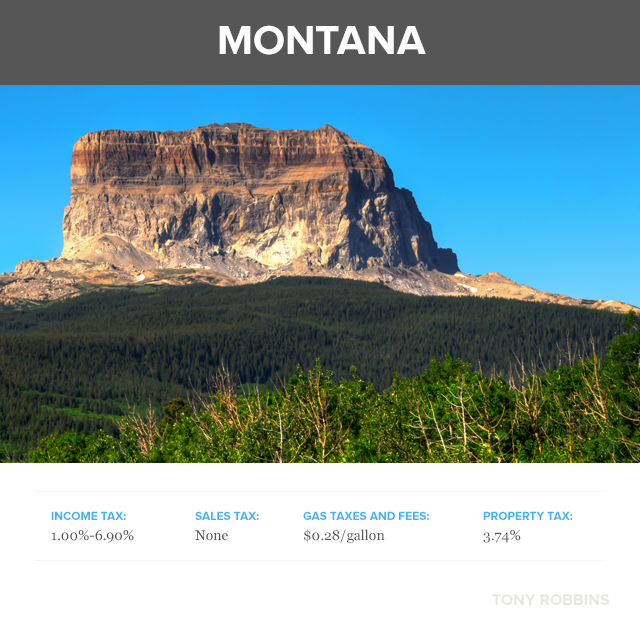 In his new tax guide, Tony Robbins' Money Blog answers some of the most important questions you have about the impact of taxes in your financial future. Your first reaction may be "absolutely not!" You may think finding a new address is just too drastic. But that's exactly the point! If you want to create big change in your life, you have to be willing to make big moves, literally. Did you know that with one single move you could increase your income by 10-30%? That's because not all tax systems are created equally. 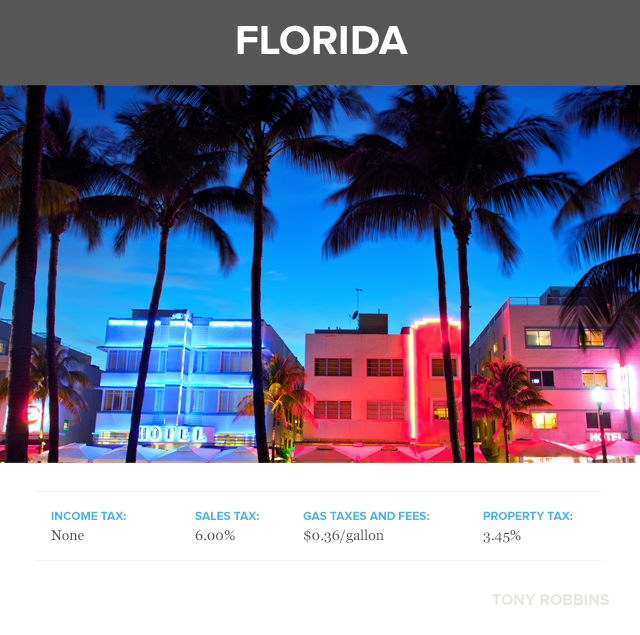 Income tax, sales tax, gas tax and property tax differ wildly across the country. 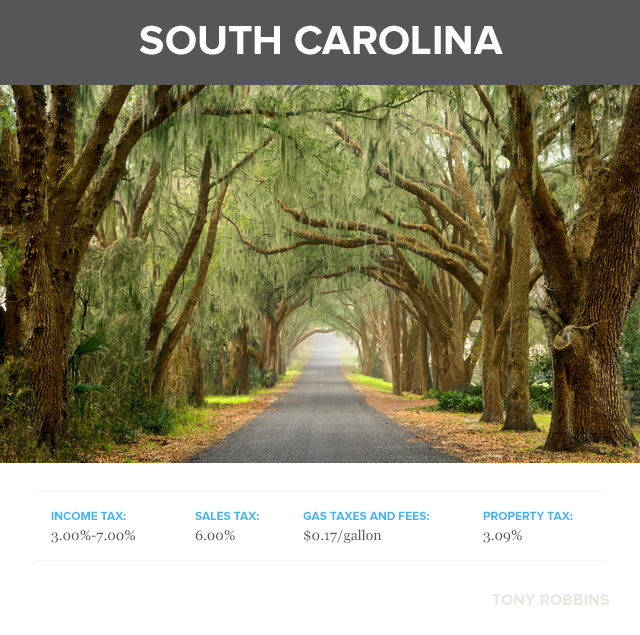 Imagine what your life would look like if you moved to a less expensive state. What would you do with the additional money you'd have? Would you invest it? Would you share it? Would you start your own business? It's one thing to be tax efficient with your investments, but it's quite another to be tax efficient with your life. Why wait until retirement to pick up and move to a more cost-effective city? Why not move now so you have even more time to reap the benefits? Ever wanted to go whale watching in Glacier Bay National Park? Or dogsledding across the Mendenhall Glacier? You even get a front row seat to watch the glorious Aurora Borealis. 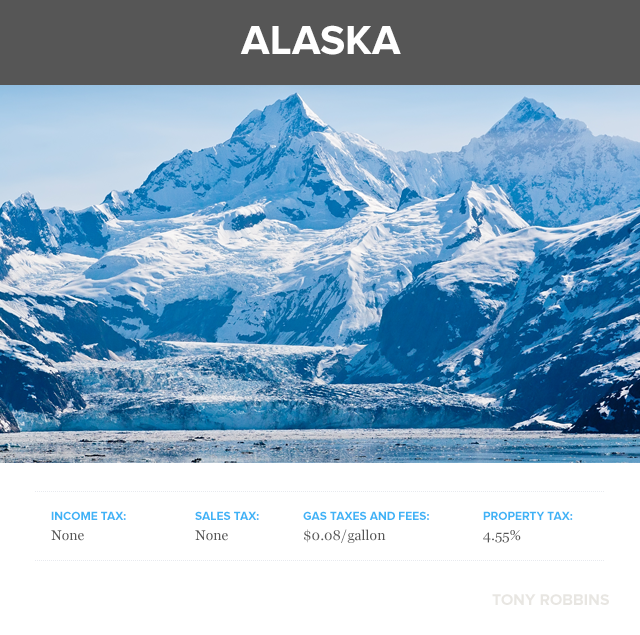 So sure, the tax system may draw you to Alaska, but the raw, natural beauty will be what keeps you there. With its spectacular landscapes and state parks, the Grand Canyon State is absolutely an adventure-lover’s paradise, but it’s also home to a thriving art scene. 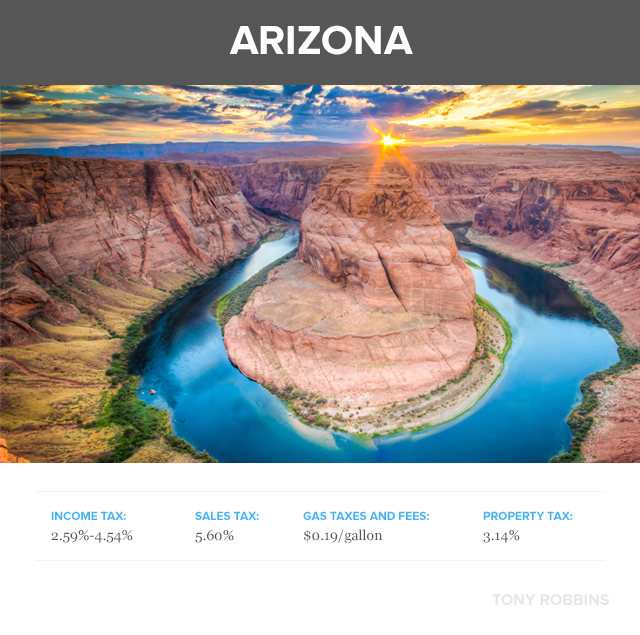 It all can be yours in Arizona, along with those tax-friendly policies and spectacular desert sunsets. The Sunshine State is the place to enjoy gorgeous tropical beaches or explore the wildlife of the Everglades. Florida just so happens to be a great for kids. From the Kennedy Space Center to Disney World, there are endless opportunities for fun and excitement, especially when you save your hard-earned money from the tax man. The great state of Montana is an outdoor adventurer’s dream year round. From a peaceful afternoon fly fishing along the Madison River to skiing in Big Sky or Bozeman, there are endless opportunities for exploration and excitement in Montana that are guaranteed to rejuvenate your body and refresh your perspective. There’s a lot more to Nevada than the bright lights of Las Vegas. The Silver State features spectacular natural splendors, from the stunning sandstone formations of the Red Rock Canyon to the carved cliffs of Cathedral Gorge. 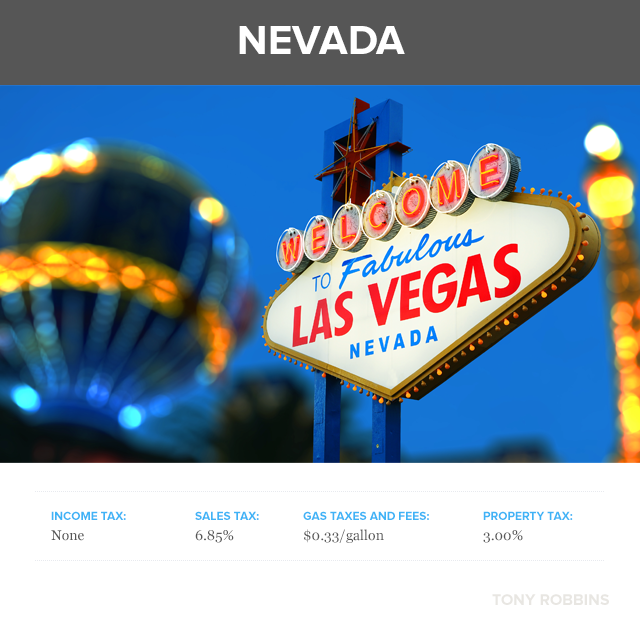 And for those who enjoy the finer things in life, Nevada has no shortage of ways to use the money you’ll save by moving to this great state. 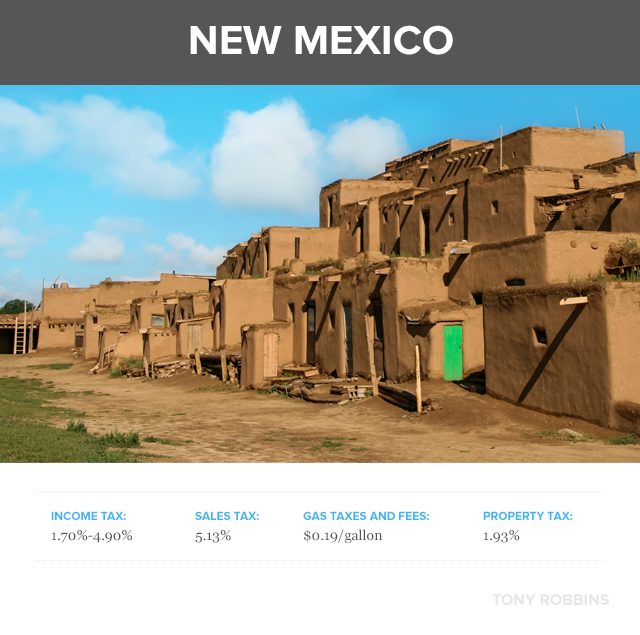 It’s called “The Land of Enchantment.” Not only is New Mexico’s landscape wildly diverse, its vibrant culture blends flavors of Mexican, Spanish, American Indian and the Old West into one mix. It also has a booming artistic community and delicious local fare? It’s the perfect recipe for spending less money on taxes and spending more time enjoying life. Looking for an up-and-coming start-up and tech community? Try Greenville. More interested in the old-world charm of sprawling estates? Then look to Charleston. The summer offers views of the sandstone formations of Monument Valley or the gorges and slot canyons of Zion National Park. The Cowboy State is equally enthralling in the winter with world-class skiing, scenic drives and of course, the iconic Sundance Film Festival. 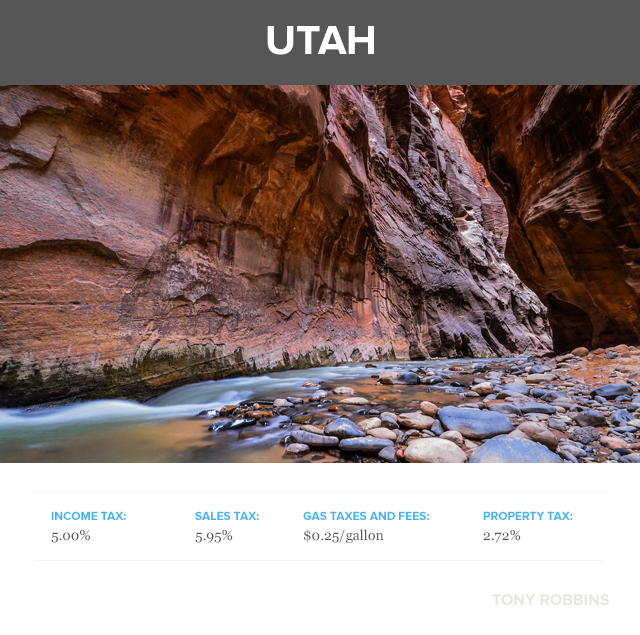 Utah is as family-friendly as it is tax-friendly. 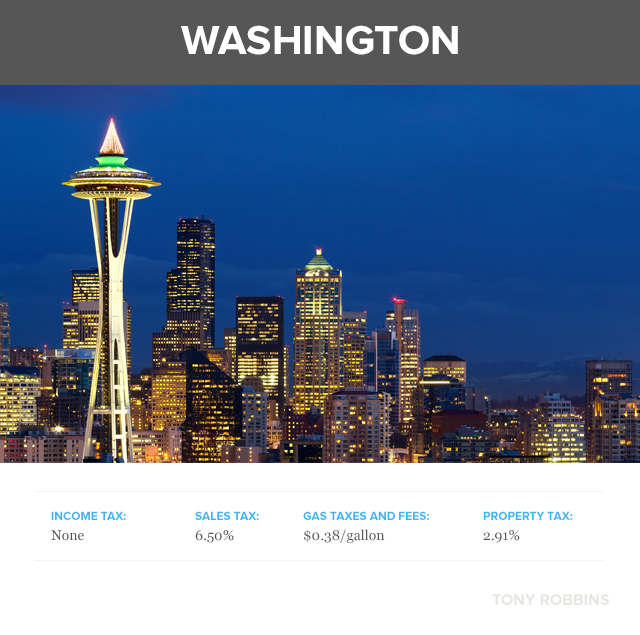 Whether you opt for the urban soul of Seattle or the rugged landscape of Olympic National Park, by moving here you will be marking down the amount you pay in taxes, and you’ll be marking off items on your bucket list. 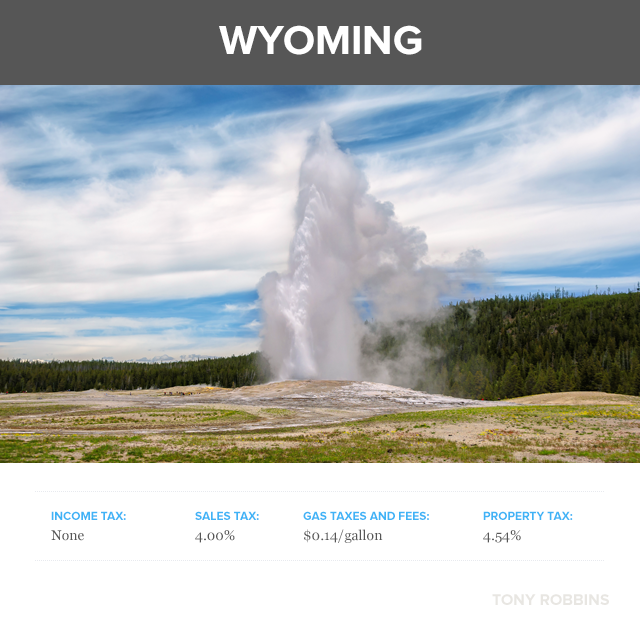 If the tax benefits of living in Wyoming aren’t enough to entice you, consider the state’s natural beauty. With Yellowstone and Grand Teton National Park in your backyard, you will get a front row seat to some of the country’s most fascinating wonders. Residents also flock to Jackson Hole, where ski resorts are the state's top winter perk.